An initiative that would require law enforcement to receive violence de-escalation and mental-health training in addition to changing the legal standard for use of deadly force enjoys overwhelming support among voters, a new poll has found. 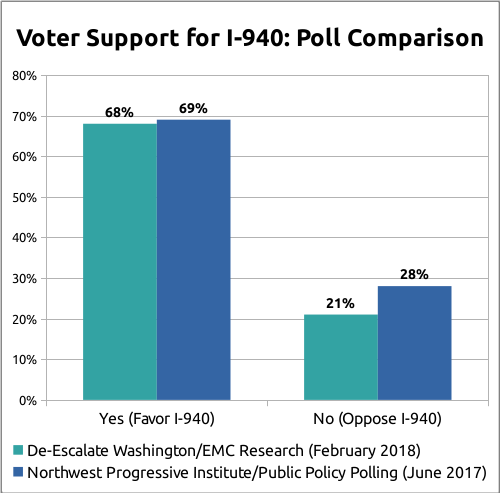 De-Escalate Washington, the coalition spearheading the initiative, announced today that it had commissioned EMC Research to gauge public support for the measure. EMC’s survey of seven hundred and forty likely Washington voters was in the field from February 8th-15th. The firm read the ballot title to respondents and found that 68% of likely voters support the measure, while 21% are opposed. The poll has a margin of error of +/- 3.6%. NPI is a coalition member and has taken a position supporting Initiative 940. There may be an initiative on next year’s ballot concerning law enforcement. The description reads as follows: This measure would require law enforcement to receive violence de-escalation, mental health, and first-aid training, and provide first-aid; and change standards for use of deadly force, adding a “good faith” standard and independent investigation. If this measure were to appear on the 2018 statewide ballot, would you definitely vote in favor, probably vote in favor, probably vote against, or definitely vote against it? NPI’s survey of 887 likely 2018 Washington State voters was in the field from June 27th-28th, 2017; all respondents participated via landline. Our poll has a margin of error of +/- 3.3% at the 95% confidence level. Here is a chart showing how the two surveys compare. Secretary of State Kim Wyman announced last month that Initiative 940 had qualified as an initiative to the Legislature for 2018. Send it to the November 2018 ballot with an alternative. The Senate Law & Justice Committee and House Public Safety Committee will hold a joint hearing on the measure tomorrow in Olympia at 7 PM.